Facebook Ka Password Kaise Change Kare : Aaj ham baat karenge Facebook security ke bare me aur woh hai facebook ka password kaise change karte hain. Jee-han dosto agar aap regular facebook use karte hai, Aur apko Facebook password change karne ka tarika pata nhi hai toh aap feature me badi musibat me padh sakte hai, Kyu ki agar apke fb id koy hacker ne hack kar liya toh account ko recover karna bhut hi muskil ho sakta hai. Facebook account hack hone ke baad kya kare uski jankari yaha hai. So friends agar apko facebook ka password kaise change karte hain uski jankari malum ho toh agar apke password kisi ko pata chal bhi jaye toh apko tension lene ki koy baat nhi rahegi, kyu ki password change karna bhut hi easy hai. Dosto Fb ka password change karna hai toh uske liye apko sirf kuch hi steps ko follow karna hoga. 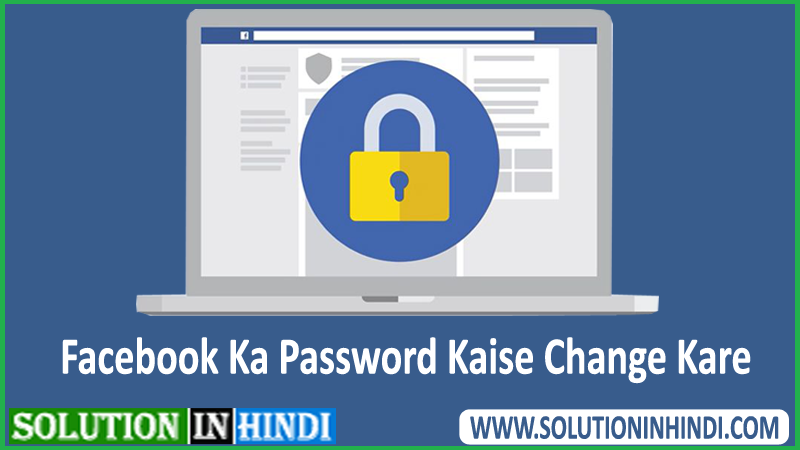 Toh chale details se jante hai – How to change facebook password in hindi. 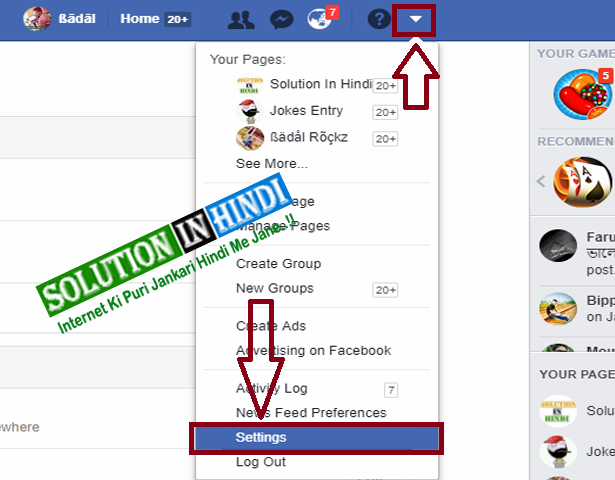 Actually ye post karne ke liye karne Sahil ne Solution In Hindi ke Facebook Page me message kya tha ke ” How to change my facebook password “. So Friends, Agar apko bhi Computer, Mobile, Earn Money, Social Media, Facebook, YouTube, WhatsApp, Technology News And other Internet Related koy bhi sawal hai toh abhi hamre Fb Page par message send kare. Friends jaise ki me pehle hi bata chuka hu fb ka password change karne bhut hi easy hai, main apko desktop or mobile se facebook password change kaise kare. dono se karke dekhaunga. Step-1 Sabse pehle facebook par jake apke account login kare. Step-2 Login ho jane ke baad right side me ek down arrow hai us par click karke niche Settings par click kare. 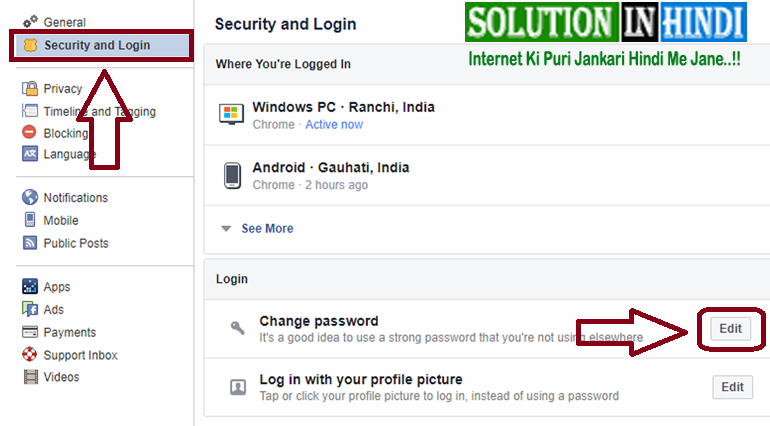 Step-3 Settings page ke left side me Security and Login hai uspar click kare. phir Change password par click kare. 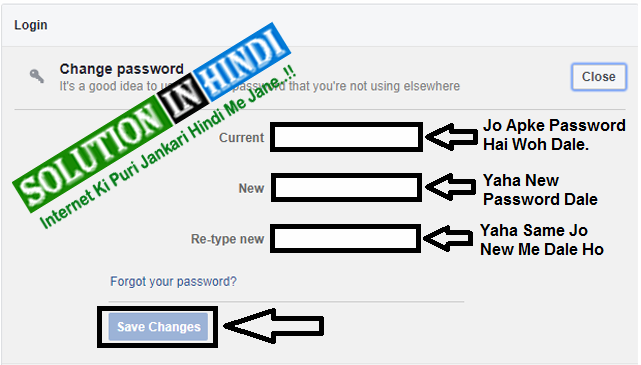 Step-4 Facebook password change karne ke liye yaha apko 3 options ko fill karna hai. Current: Yaha dalna hai apke password, jo abhi apke facebook account ke hai. New: Aap jo new password rakhna chahte hai woh yeha dale. Re-type-new: New password ko iss option me dubara dale. (Basically ye confirmation karne ke liye hota hai ke aap jo password rakh rahe ho woh apko pata hai). Step-5 New password dal diye hai toh finally Save Changes par ok karde. Step-6 Ab aap Review Other Device par tick (•) lagake Continue par click kare. Done! Itna karne se apke facebook password successfully change ho jayega. 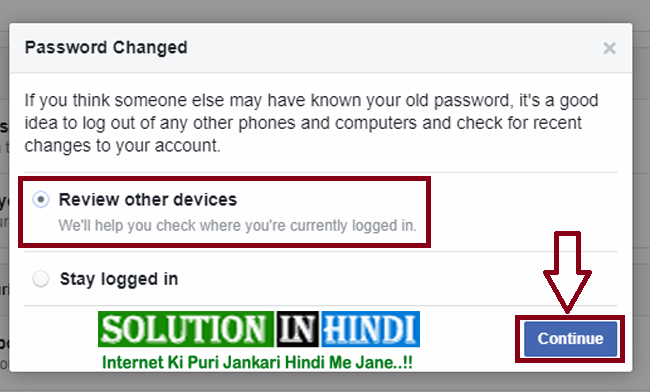 Aur other jitne bhi devices me pehle se apke fb account login hai sabhi me logout ho jayega. So friends agar apko kisi steps me problems aaye toh sidha comment box me apka question dale. Step-1 Sabse pehle apke fb account login kare. Step-2 Login ho gaye hai toh facebook Settings & privacy par enter kare. Step-3 Settings me aagaye hai toh Security and login par click kare. Step-4 Now Change password par click kare. Step-5 Password change karne ke liye 3 options ko fill karna hai. Current: Yaha old password dale jo abhi hai. New: New password dale jo rakhna chahte hai. Re-type-new: New password ko dubara dale. Step-6 Ab Save changes par click kare. Done! lijiye apke facebook id ka password change ho gaye hai. Note: Agar aap mobile se settings me enter nhi kar paa rahe ho toh Sebse pehle fb login kare phir yaha Change Password par click karke directly fb password change kar sakte hai. We like to honor many other web websites around the internet, even if they arent linked to us, by linking to them. Beneath are some webpages worth checking out.